Our Horn Cover Medallions bolt onto your existing Cow Bell style Horn Cover in less than 15 minutes with stainless steel screws that we supply for you. Each cover Medallion comes with a full set of mounting and installation instructions. Email me at g.mayhew@sympatico.ca for International shipping prices. 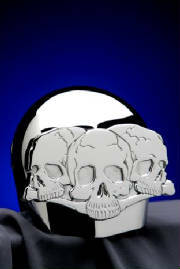 BoneYard Custom Limited Edition Harley Davidson® cowbell style horn cover medallion.